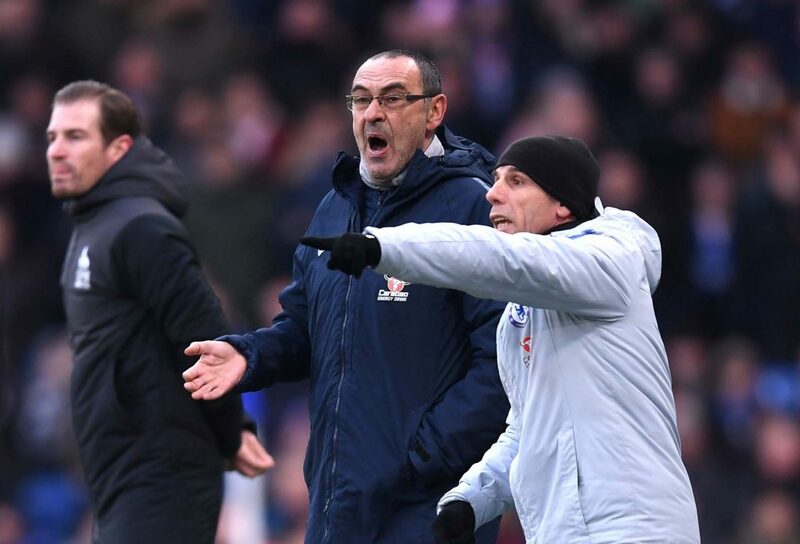 Maurizio Sarri, Manager and Gianfranco Zola, Assistant Manager reacts during the Premier League match between Chelsea FC and Huddersfield Town at Stamford Bridge on February 2, 2019 in London. Artificially creating a big match in each round from a seemingly random draw must get harder with each year but the FA Cup fifth round draw handed us Manchester United at home. Alvaro Morata’s short and trouble tenure as our most expensive player is over. He moved to Atletico Madrid on an eighteen-month loan. Alvaro scored 24 goals for us in 72 appearances, which is not too bad. But the prediction before he came that he would score freely before getting injured came true and he never really fitted into Antonio Conte’s scheme. Maurizio Sarri confirmed that Callum Hudson-Odoi will not be sold in this transfer window. He hinted that we will keep him in the summer too as we play brinkmanship with the eighteen months left on his contract. Abject doesn’t describe this performance. After dominating possession and creating a few chances in the first-half we wilted and conceded simple goals on the break against a Bournemouth side who have just come off an 11-game losing streak. Most managers would be packing their bags after a performance like this. This was our heaviest defeat since the late 90s, the worst of the Abramovich era and a resignation letter from Maurizio Sarri. Because it was not as if this hasn’t been coming. At the start of the season Sarri talked of how his team would need a few months to adapt to his football. What actually happened is that it took a few months for opposition managers to rumble his system. Wolves, Leicester, a pathetic Arsenal side and now Bournemouth speak of a coach wedded to a style of play that is as outdated as it is easy to counter. Getting past an injury ravaged Spurs into the League Cup final is some achievement but Sarri hasn’t shown anything in the way of tactical adaptation (unless you count playing game after game without a striker ruining Hazard’s developing understanding with Giroud), none of his substitutions have brought about a change in fortunes and, it seems, if we carry on with him we will miss out on the top four again. Others have argued that Jurgen Klopp took four years to develop his team to the stage where they are favourites for the title but fans could see their team developing in all that time, with a clear attacking strategy and philosophy. Klopp was building a team and a system that works. Sarriball looks like crabbing the ball sideways forever and hoping for a penalty to break the deadlock. Chelsea have only scored three league goals in the last six games. Earlier, the lesser spotted Baba Rahman returned from his loan with Shalke and headed to Reims. The left-back signed from Augsburg back in 2015 but hasn’t really made an impression after loans and a knee injury have blighted his time with us. Things have taken a surreal turn when we apparently offered Tottenham Hotspur Michy Batshuayi on loan until the end of the season. Offering to help a direct rival with their striking dilemma speaks volumes about how Chelsea is being run since the departure of Michael Emenalo. In the end Batshuayi will finish the season with Crystal Palace – where he will be a good fit. Lucas Piazon joined Serie A strugglers Chievo where he should at least get a game after a good season last term at Fulham he hasn’t played any football this season. In a truly bizarre press conference this afternoon Maurizio Sarri insisted that he is a dreamer and will stick to his philosophy come what may. He pointed out that the Barcelona side of a few years ago always played the same way and won everything. We don’t remember Barcelona surrendering 4-0 away to Bournemouth under Cruyff. The point he is again missing is that the managers of those sides might have had to occasional poor game none of them went on a run of only three goals in six games. Each of those club’s managers had a clear positive impact on the attacking philosophy of the team and the fans could see the direction of travel, the path forward… all we can see is another sideways pass. Well, he bought himself some time A thumping home win is probably enough to keep Sarri in employment for another week at least but it took a visit from a team rock bottom of the Premier League to make Sarri’s football look good. And it would be churlish no to admit that everything clicked today. Higuaín meshed seamlessly with Hazard as both scored two and looked to combine on dozens of other occasions. The midfield worked well too with the recalled Ross Barkley working extremely hard. Everyone was switched on to t he defensive duties as we pressed and harried opponents when we didn’t have the ball. David Luiz headed home the fifth at the death to cap a fine afternoon. The only cloud was wondering which Chelsea will show up for the next game. One of the few FA Cup toes to survive the big chill and goals from Drew Spence and Hannah Blundell secured passage to the next round. Over the weekend Victor Moses made his debut for Fenerbahce and scored a goal after a scintillating run … probably trying to remind the Blues what they have let go. Michy Batshuayi also contributed to a win as his shot was spilled but a Palace colleague stabbed home the rebound as the Eagles beat Fulham.